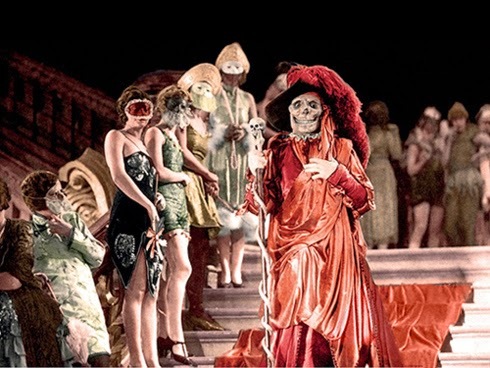 We're continuing our look at films set in Paris with the 1925 version of The Phantom of the Opera. 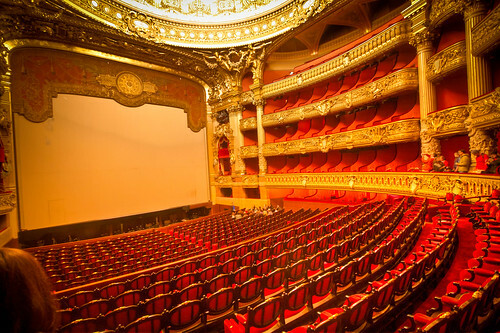 The film was made on an elaborate soundstage in Hollywood that recreated the Paris Opera House. Many old Hollywood films recreated famous Paris locations on studio soundstages, but perhaps none were more elaborate than the Paris Opera House sets for the 1925 silent film, The Phantom of the Opera. 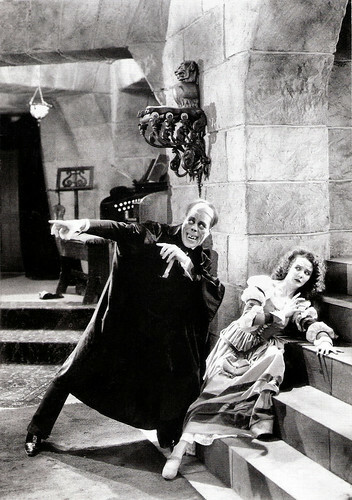 The Phantom (Lon Chaney Sr) kidnaps opera singer Christine (Mary Philbin) in The Phantom of the Opera (1925). In 1924, Universal Studios acquired the rights to Gaston Leroux's 1909 novel for their biggest star, Lon Chaney Sr. The novel tells the chilling tale of a deformed man (Chaney) who haunts the Paris Opera House. He becomes enamored with a beautiful singer (Mary Philbin), so he kidnaps her and drags her to the catacombs under the building. Chaney and Universal already had a box-office bonanza with a somewhat similar film, The Hunchback of Notre Dame (1923), so studio chief Carl Laemmle decided to spare no expense with The Phantom. Laemmle, who had admired the Opera House on a visit to Paris, decided to lavishly recreate the building on the Universal backlot. 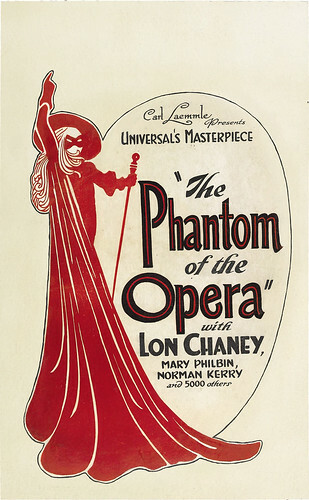 A vintage window card for The Phantom of the Opera (1925). 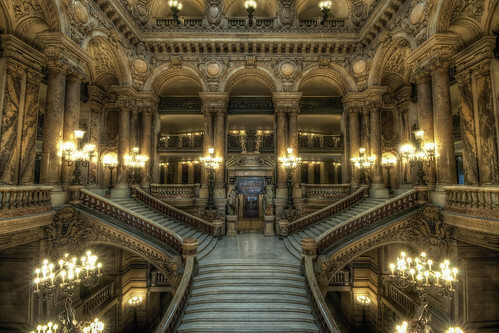 The Paris Opera House (its proper name is the Palais Garnier), is one of the great landmarks of the City of Lights. 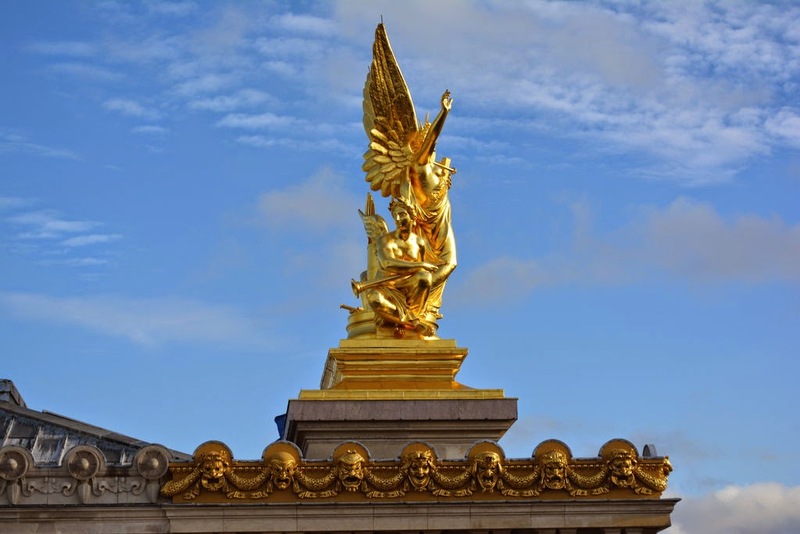 It was built between 1865-1871 in the Second Empire style by architect Charles Garnier. 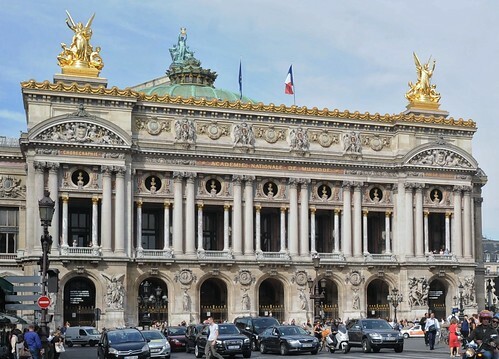 The facade of the Paris Opera House. Universal did not recreate the entire facade of the Opera House, but they did recreate a portion of the rooftop for a scene where Christine confesses all she knows about the Phantom to Vicomte Raoul de Chagny (Norman Kerry). Unbeknownst to either of them, the Phantom is perched above them on a statue, eavesdropping on their conversation. 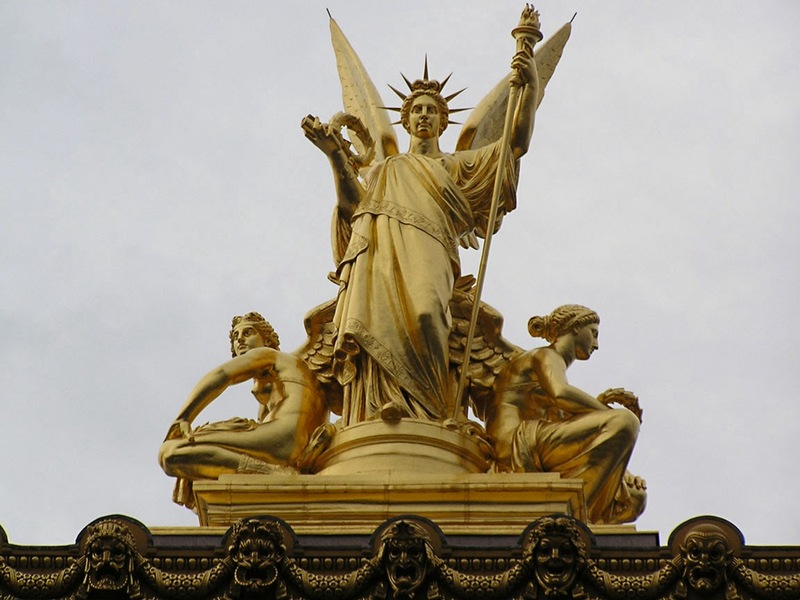 The statue is often misidentified as that of Apollo, which sets at the center of the building, but that is clearly incorrect. The phantom is actually perched on the La Poesie statue, which is on the right apex of the Opera House. The Phantom of the Opera's showstopping sequence was the masquerade ball. 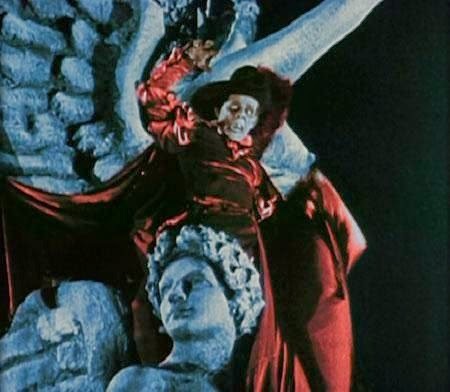 It was filmed in Technicolor, and features Chaney dressed as The Masque of Red Death from the short story by Edgar Allan Poe (photo at the top of the article). Universal recreated Garnier's grand staircase for this sequence. The original staircase was made of white marble with red and green balustrades. The Opera House's lavish auditorium was painstakingly recreated on Universal soundstage 28. The set was constructed with steel girders, so it would be strong enough to support an audience and the performers. The actual stage was built just like the one in Paris, complete with curtains and trap doors that would be needed for a real opera production. The famous sequence where the chandelier in the auditorium crashes into the audience is based on real-life events. 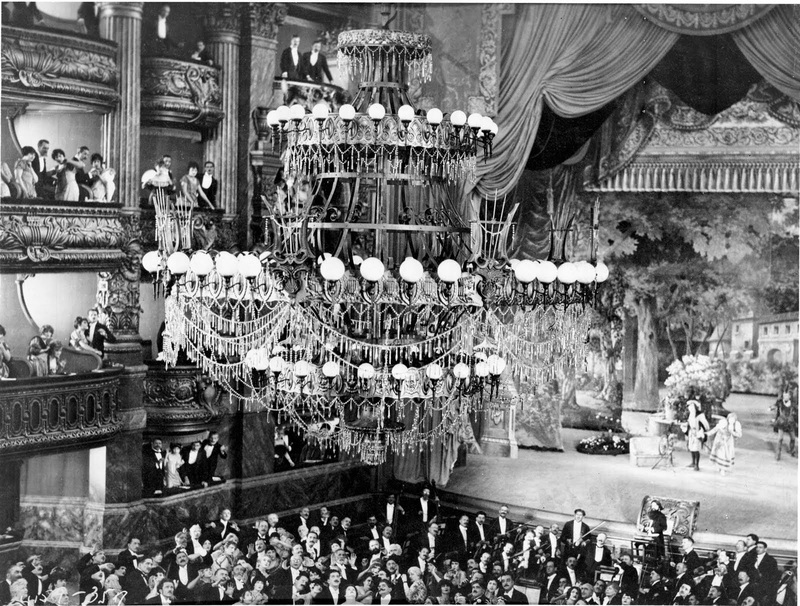 Garnier designed the elaborate bronze and crystal chandelier, which cost 30,000 francs, as the auditorium's piece de resistance. 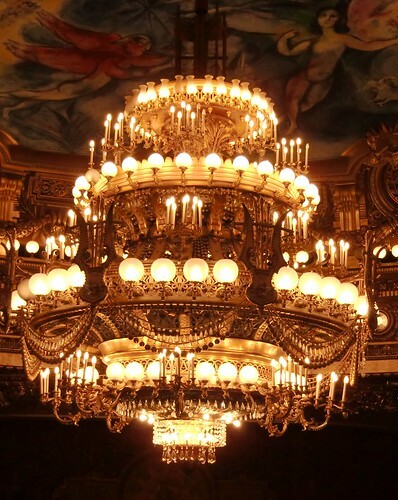 In 1896, one of the chandelier's counterweights broke and it crashed into the audience, killing one person. Soundstage 28 was used for many films through the years, including Dracula (1931), The Sting (1973) and most recently The Muppets (2011). Sadly, it was torn down in September, although the auditorium set was preserved for future display (there's more here).